The shoulder is one of three main joints in the forelimb. Located above the elbow, it's stability depends largely on muscles and ligaments and the joint itself is not easily braced. which links the two front legs together. This strap prevents the limbs from being abducted, and also restricts range of flexion and extension. 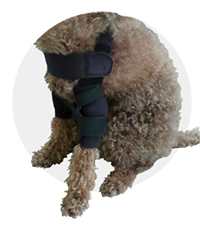 This type of shoulder support can be used before surgery, to evaluate if temporary restriction of motion may help the issue, and post-surgically to help protect the repair.